As a child of six I wanted to be an artist, but nobody in my family had artistic learning’s, so I taught myself how to draw. I used to draw on anything available, under tables and even on the pavements of the street where we lived in Byker, Newcastle upon Tyne. I left school in 1955 and studied art at the college of Art & Industrial Design on a three year N.D.D course in life drawing, design, drawing for reproduction and printing. Around this time my mother took ill and died and I was forced to leave without finishing the course, and I never painted for fifteen years. During this time I became good friends with the Queens artist Pietro Annigoni, our friendship blossomed and he soon became my mentor, and it was because of him i got back into painting. Through my tuition I received a commission and painted the telephone manager P.I.Docherty the next commission I received was to paint the Pipe Major Peter Lambert B.E.M. Unfortunately I was in hospital when it was presented at Blagdon Hall by Princess Margaret in 1987. I then received a commission to paint the Lord Mayor of Newcastle upon Tyne, Arthur C Cook, where it hung in the mansion house in Jesmond for one year with paintings by T.M Richardson and W. Richardson, Father and Son, I have always wondered if we are related and that’s where my artistic abilities originated from. I have always loved dogs and I showed Shetland sheep dogs for years, I soon became well known among breeders for my beautiful pet portraits of various top breed dogs. I’ve recently painted His Royal Highnesses Prince William and Prince Harry ‘the wild ones’. I then sent two prints to Clarence House, and I was thanked by the Prince of Wales himself with a lovely letter. 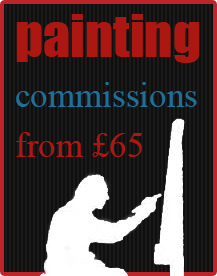 I currently have paintings in Australia, Netherlands, Portugal, France, USA and all parts of the UK.